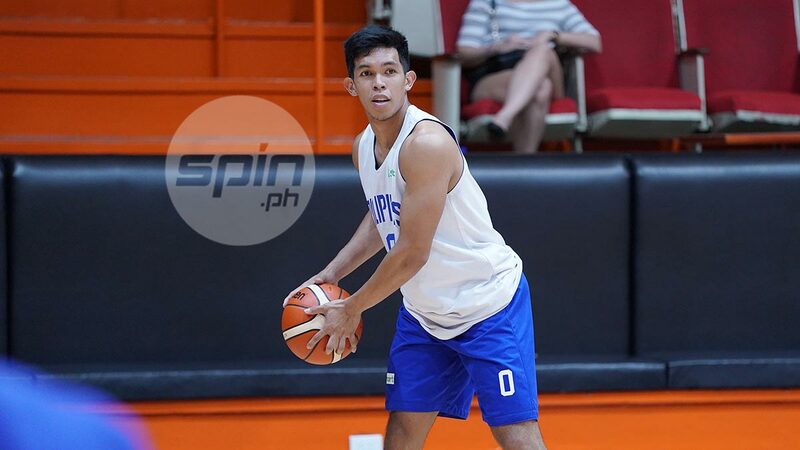 IT doesn't matter whether Thirdy Ravena makes it to final 12-man lineup of Team Pilipinas or serve as a reserve when the national squad goes on the road for the final window of the FIBA World Cup qualifiers. Just being around some of the country's finest players and handled by one of a multi-titled coach is already a great learning experience for the Ateneo star. "They're guiding me sa practicie. Tinuturuan nila akong kung ano yung na-miss out ko, sinasabi nila sa akin," said Ravena of his 'kuyas' shortly after Team Pilipinas' practice Monday night at the Meralco gym. Being the youngest - and the only collegiate player - in the compact training pool of Guiao, the UAAP Finals MVP appears to be a longshot to make the final roster of Team Pilipinas in its games against Qatar and Kazakhstan, respectively. But that doesn't mean he's not looking forward to cracking the lineup. "Of course it's a challenge for me to try and make the lineup kasi andito na rin ako. And I want to be able to pay back the trust na binigay ni coach Yeng by really playing hard," said Ravena. "I need to prepare as best as I can para if ever the time comes na may role akong kailangang gawin sa team, magiging ready ako kung anumang role yun." Ravena has been given the go-signal by Ateneo and coach Tab Baldwin to be with the team when it travels to Doha, Qatar starting this Saturday. The Filipinos won't return until Feb 25. Ravena said he already submitted his excuse letters to his teachers just to put everything in order. But even if he's away from.the country, Thirdy still has to perform his duty as an Atenean. "Kahit nasa Qatar and Kazakhstan ako, may kailangan pa rin akong gawin na academic requirements. So I will be in touch with my teachers just to make sure na I'm up with whatever that were discussed in class," he disclosef. "I'm just here to support the team. Hopefully I'm ready and I'm just trying to prepare right now."